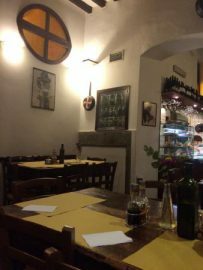 Il Vegetariano is a restaurant located in the Florence City Center, walking distance from the Duomo. It is a casual restaurant catered to individuals who do not eat meat, and it is a little hole in the wall that many locals go to. The restaurant is a bit confusing if you are a first time customer because there are two separate entrances, one leading you to the area where you place your order and the other leading you to the tables. As you enter, you are greeted by the host working the register and in view of the written menu located on the wall. You will also see a salad bar and dessert selections on display prompting you to try them. You are surrounded by wooden panels and simple decorations that give off a warm and cozy setting. The menu offers a variety of wine selections for those with different tastes. The beverage menu also includes coffee, beer, and liquor, with everything being reasonably priced. However, the food selection was limited in comparison to the beverage menu, only offering four primi dishes and four secondi dishes. We each ordered our own customized salads to start, which were fresh and had a large portion size. The customized salad option was a great choice and gives the customer a variety of salad options from you to pick and choose from. Some of the produce for the salads included beats, lettuce, spinach, beans, onions, carrots, bell peppers, and more. We ordered the the Orecchiette con Salsa di Melanzane alla Lorna Seguite con Ricotta Stragionata as a primi course. It consisted of a shelled pasta with ricotta cheese, eggplant, and red sauce, which really thrilled us. The eggplant was cooked to perfection and lightly seasoned, which paired well with the red sauce. We also ordered the Farfalle al Forno con Salsa di Verdure alla Contadina e Pecorino, which consisted of bow tied pasta baked with red sauce, vegetables, and pecorino cheese. For our secondi course we ordered the Sformato di Broccoli e Ricotta. It consisted of broccoli with ricotta baked together, and it was my favorite dish of the night. I enjoyed the cheese that topped off the meal because it gave the dish more texture. All the products were fresh and the dishes had the warmth of home-made food. The chefs made a great effort to make sure that the ingredients were all fresh and cooked to perfection. Moreover, the restaurant was filled with locals and families. We were the only Americans in the restaurant, which made the experience even better because we knew we were eating authentic Italian food. The service was phenomenal, however, I was surprised that there was no waiter service. There was charming gentleman taking our orders at the front and he was very helpful when we were deciding on what to order. He explained what was inside each dish and even recommended some dishes for us. The prices per dish were around the average price for an Italian dinner. Overall, the meals are simple but pack a lot of flavor. I had a pleasant dining experience here, and would recommend this to those who are vegetarian and to those who are not as well. If you want to experience a delicious vegetarian meal then I highly recommend Il Vegetariano. This entry was posted on Friday, June 30th, 2017 at 2:51 pm. It is filed under Florentine Foodie. You can follow any responses to this entry through the RSS 2.0 feed.